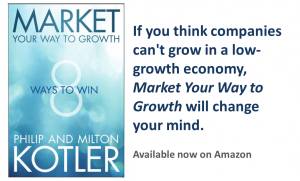 Marketing guru Philip Kotler and global marketing strategist Milton Kotler show you how to survive rough economic waters. Build Your Market Share: Outperform your competitors and grow your market share. Develop Enthusiastic Customers and Stakeholders: Attract fans and develop dedicated supply chain partners. Create a Powerful Brand: Design a powerful brad that serves as a living platform for your organization’s strategy and actions. Innovate New Products, Services and Experiences: Develop a culture of Innovation and think freshly about new offerings and experiences. International Expansion: Identify international macro and micro markets of high growth and enter them successfully. Acquisitions, Mergers and Alliances: Grow via attractive partnering opportunities through acquisitions, mergers, alliances and joint ventures. Build an Outstanding Reputation for Social Responsibilities: Improve your company’s social character to win more respect and support from the public and stakeholders. Partner with Government and NGOs: Successfully bid to provide services and products that government all over the world need. These are the most perilous times since the Great Depression, yet growth is still possible. Learn how to implement these proven strategies and achieve growth rates that your competitors will envy.